Event Catering is one of Cork’s, Munster's and Irelands leading corporate and home catering companies. Based in Cork we provide catering menus and full event management to suit all budgets whether it be for a family or corporate event our teams cover the entire country. We have many years experience providing catering for homes, offices and companies around Cork, Limerick and Dublin. With our professional chefs tailoring menus to meet all your needs and budgets. We now have some fantastic menus and prices available for those Communion and Confirmation parties starting at just €7.00 per guest. So if it's catering for a communion or confirmation; birthday or christening party; anniversary or engagement celebration or wedding feast for one of the family or at work for an office lunch platters, product launch nibbles, hot and cold finger food, canapés, company conference buffet meal, a spit roast BBQ or Christmas party we provide all types of elite catering to meet your needs. We can provide catering from 25 to 1000 guests. Our contract catering division can also provide the service of managing your staff canteen facilities, using are years of retail restaurant management to help you run a cost effect staff meal facility. With years of experience in providing catering to meet all budget and events for all those family celebrations Our Mission is to provide each and every client with a culinary experience to remember. 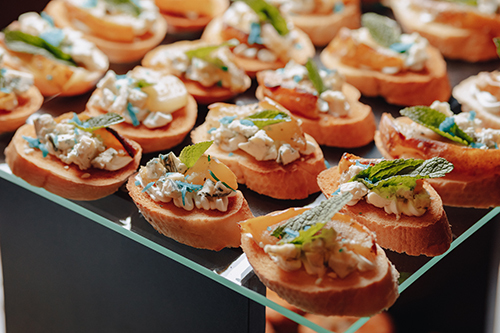 Canapés make ideal party food! These bite-sized morsels are guaranteed to impress your guests. Selection of baby rolls & butters are included with all main course dishes. 48 hours notice prior to booking is required.